1Hepatitis B Molecular Laboratory, Department of Virology, School of Public Health, Tehran University of Medical Sciences, PO Box: 15155-6446, Tehran, Iran. Tel/Fax: +98-21-8899-2660. 2Baqiyatallah University of Medical Sciences, Baqiyatallah Research Center for Gastroenterology and Liver Disease, P.O. Box: 15155-6446, Tehran, Iran. *Address correspondence and reprint request to: Seyed Mohammad Jazayeri Hepatitis B Molecular Laboratory, Department of Virology, School of Public Health, Tehran University of Medical Sciences, PO Box: 15155-6446, Tehran, Iran. Tel/Fax: +98-21-8899-2660. Anvari FA, Alavian SM, Norouzi M, Mahabadi M, Jazayeri. Prevalence and Molecular Analysis of Occult Hepatitis B Virus Infection Isolated in a Sample of Cryptogenic Cirrhosis Patients in Iran. Oman Med J 2014 Mar; 29(2):92-96. Objectives: The aims of this study are to investigate the prevalence of occult hepatitis B virus infection among patients with cryptogenic cirrhosis and to analyze the relationship between surface protein variability and occult hepatitis B virus infection, which may be related to the pathogenesis of occult hepatitis B virus infection in cryptogenic cirrhosis. Occult hepatitis B virus infection is a well-recognized clinical entity characterized by the detection of hepatitis B virus DNA in serum and/or liver in the absence of detectable hepatitis B virus surface antigen, with or without any serological markers of a past infection. Methods: Sera from patients with cryptogenic chronic liver disease were tested for hepatitis B virus DNA using both real-time and nested PCR. In the detected hepatitis B virus DNA samples, the surface gene was analyzed for mutations. Results: Hepatitis B virus DNA was detected in 38% of patients, all of whom had a viral load below 10,000 copies/mL. All hepatitis B virus belonged to genotype D. There were no significant associations between occult hepatitis B virus infection status and age, gender, ALT/AST levels, viral load or serologic markers of previous hepatitis B virus infection. There were 14 mutations found in 5 patients; 6 were in the major hydrophilic region, of which 4 were Y134F assigning for the "a" determinant region. All patients who acquired Y134F contained S207R (within HLA-A2-restricted CTL epitope) as a combination. Conclusion: Hepatitis B virus surface antigen variants may arise as a result of natural selection to evade the immune surveillance of the infected host, and subsequently may go undetected by conventional hepatitis B virus surface antigen screening tests. Etiological diagnosis of cryptogenic cirrhosis is significantly underestimated with current serology testing methods alone. Keywords: Cryptogenic cirrhosis; HBV surface protein mutations; Occult hepatitis B infection; Iran. Iran has an intermediate-to-low endemicity for HBV infection,26-28 and the prevalence of HBV-related cirrhosis is reported to be 51% to 56%.29 The objectives of this study were to investigate the prevalence and clinical importance of OBI in cryptogenic cirrhosis and to analyze the association of surface protein variability with OBI, which might be related to the pathogenesis of OBI in cryptogenic cirrhosis. This survey was a cross sectional study on selected patients from referral cases of cryptogenic cirrhosis (whith negative serologic test for HBsAg) to Tehran Hepatitis Network (THC) during the year 2010. A convenient sample was used and all available cases were included in the study. The diagnosis of cryptogenic cirrhosis was based on liver biopsies while in some patients who had contraindication, the diagnosis was made by conventional clinical, biochemical, imaging, and endoscopic criteria after all known identifiable causes were excluded by relevant investigations. All patients gave written informed consent to participate in the study prepared by the Tehran Hepatitis Network. All patients were negative for antibodies against hepatitis C (HCV), hepatitis D and human immunodeficiency virus. Patients who tested positive for HBV DNA by PCR and negative for HBsAg as well as HCV RNA and other factors implicated in the cause of chronic liver disease were labeled as OBI, as per the diagnostic criteria described below. A serum sample was drawn from each subject and stored at -80°C. Serological markers for HBV (HBsAg, anti-HBc and anti-HBs) were each checked using two different ELISA kits; Siemens (Germany), and Acon (San Diego, USA). HBV DNA was extracted from stored serum using the QIAamp DNA Blood Mini Kit (Qiagen, Hilden, Germany) following the manufacturer’s instructions. In brief, 20 µL of protease was added to 200 µL of serum in a 1.5 mL tube. Then, 200 µL of Al buffer was added, vortexed and incubated for 10 minutes at 56ºC. For DNA precipitation, 200 µL of ethanol was added to the mixture and centrifuged for 1 minute. Components were transferred to a collection tube containing a filter tube. Trapped DNA was washed in two steps by AW1 and AW2 buffers to eliminate impurities, with centrifugation after each step. After centrifugation, 50 µL of elution buffer was added and the eluted DNA was stored at 20ºC. HBV DNA was examined in all samples by real-time PCR (Fast-Track Diagnostic, Luxembourg). Positive samples were selected for standard PCR reactions using previous methodology,30 with the exception of using 1.5 U Taq DNA polymerase HotStarTaq PCR (Qiagen) in each reaction mixture to increase the fidelity of the amplification process. A 5-µL aliquot of the PCR product was analyzed by electrophoresis in 1% agarose gel stained by ethidium bromide and visualized under ultraviolet light. The diagnosis of OBI was made when either real-time or nested PCR showed HBV DNA in the absence of detectable HBsAg, regardless of being seropositive or negative either for anti-HBc or anti-HBs or both markers. Direct sequencing of complete genomes was carried out (ABI-3130XL DNA Sequencer, PerkinElmer, Foster City, CA, USA) using 0.5 μL of internal primers.30 The comparative analysis was done using Chromas and BioEdit Package software version 7.0.5.3. Surface gene amino acid/nucleotide variations were compared with reference sequences from the GenBank database by aligning the corresponding sequences to be representative of the most frequent nucleotide found at each position from different Caucasians. Genotype D is the only genotype that has been reported among Iranian HBV-infected patients.28,31-33 Thus, the consensus nucleotide sequences and derived amino acid sequences from samples were compared with reference sequences of HBV genotype D (with the corresponding the most similar, AB033559, Okamoto, 1987), as well as with Iranian sequences obtained from GenBank and from our laboratory data. Any amino acid differences from the former were considered as "variants" (host HLA-determined), while any amino acid differences from the latter (Iranian database sequences) were considered as "mutations." Using contingency tables, associations between categorical variables were analyzed using χ2 and Fisher exact tests and the mean values were compared by t-test. A p-value of <0.05 was considered statistically significant. HBV surface gene and protein variability were studied by amplifying and sequencing. All were infected with genotype D, subgenotype D1 and ayw2 subtype (results not shown). Table 2 showed 37 mutations occurred at 16 nucleotide positions, of which 18 (49%) were non-synonymous (amino acid altering) and 19 (51%) were synonymous (no amino acid changing). At the amino acid level, 14 substitutions occurred in five patients; six were in MHR, of which four were Y134F assigning for the "a" determinant region. 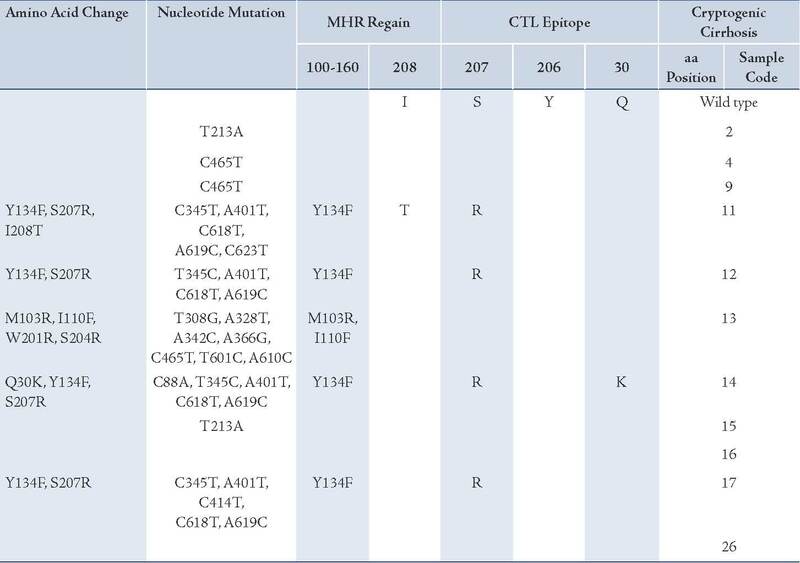 Six mutations occurred in two different locations: one in Q30K (isolate 14) and five in residues 207 and 208 (Table 2). Both these domains are known to be within HLA-A2-restricted CTL epitopes (29-30). Interestingly, all patients who acquired Y134F in the "a" determinant region contained S207R as a combination (Table 2). Three mutations emerged in the inter-epitopic region. Furthermore, it was possible to identify the level of surface protein evolution between isolates by measuring the ratio of synonymous to non-synonymous nucleotide sequences. The mean ratio for all sequences was 1.05 according to the number of mutations per site. Table 1: Comparison of baseline characteristics of patients with and without OBI. Table 2: Amino acid mutations within surface protein of patient groups, arranged by immune epitopes. Amino acids are described by single-letter codes and numbered from the beginning of the surface protein. Only positions at which changes occurred are shown, so relative proportion of epitopic to non-epitopic areas is skewed in favor of regions where substitutions occurred. A number of explanations for the persistence of HBV DNA in HBsAg-negative patients have been proposed, including HBV DNA in low copy numbers and low quantity of HBsAg in serum (just enough for viral assembly but below the sensitivity of assays). In the present study, HBV DNA levels in OBI-positive patients were found to be quite low, as has been observed in other studies.5,34 An alternative explanation for HBsAg negativity is mutations in the structural protein altering the antigenic properties and thus escaping detection by routine tests.4,19-21 Indeed, other studies have found surface variants in a number of patients with cryptogenic cirrhosis and OBI.11-13 In this study, 5 out of 11 OBI-positive patients had mutations within the major hydrophilic region of the surface protein, encompassing amino acid residues 100-160, including the "a" determinant region. Most of the amino acid changes observed in the present study were clustered in two regions: the "a" determinant region and residues 204-215 of the small surface protein. These residues have been shown to stimulate the host B cell and CTL epitopes, respectively.35,36 Findings of this study were in accordance to the findings of other studies.23,24 The presence of HBsAg mutants has been reported in some patients with chronic HBV infection who have not received either active immunization or HBIG, suggesting that pressure from the host immune system alone is able to drive the selection of HBV mutants.19,37,38 If this is the case, these persistent mutants may be responsible for liver injury. In other studies, however, the failure to detect HBsAg in OBI was not fully explained by surface gene mutations, and no strong candidate mutations that are both shared by most OBI strains and are absent in non-OBI strains were identified.14,23,24,39-41 This possibility is strengthened by observations that OBI can be detected in individuals after spontaneous HBsAg seroclearance, and OBI in these cases appears to represent leftover virus in the liver after HBsAg seroconversion.42 In this scenario, the viral genetic changes may not be the cause of OBI but may instead be characteristic of less fit viral sequences that are not as quickly cleared from the liver by the immune system. In this study, 6 out of 11 OBI-positive patients did not contain any surface protein mutations. Studies that have analyzed the full viral genome have reported different results.23,24,43 Moreover, no relationship was found between the presence of OBI and demographic, biochemical (AST, ALT), or serologic (anti-HBs, anti-HBc) features. Thus, none of these parameters were useful for distinguishing OBI-positive from OBI-negative patients. Interestingly, the ratio between synonymous and non-synonymous nucleotide sequences in OBI-positive patients was 1.05. This means that negative selection pressure had already been exerted on the surface protein (due to immune or functional constraints) after a long-lasting chronic HBV infection. Comparing to genotypes B and C from cirrhotic patients in GenBank (results not shown), the occurrence of so few substitutions in genotype D suggests that considerable constraints must exist against HBV variability in a particular genotype infecting a person of a particular background, or that genetic drift in Iranian genotype D is relatively slow. A definite conclusion would require a cohort study involving mutational analysis of multiple genotypes and stages of infection in chronically infected individuals ranging from inactive carriers to HCC cases. The present study had some limitations that must be recognized. First, cross-sectional studies are carried out either at a single point in time or over a short period. Thus, associations identified in cross-sectional studies should not be considered as a causal relationship. Second, the sample size was small. Third, the samples were selected conveniently and not randomly. Therefore, the current findings may not represent the whole population of Iranian cryptogenic cirrhosis patients. This study suggests that diagnosis of cryptogenic cirrhosis based on HBsAg testing alone may miss a substantial proportion of HBV infections, and that assaying for HBV DNA is therefore important in HBsAg-negative patients. As HBV-related cirrhosis carries a high risk of development of HCC, follow-up studies should be conducted on OBI-positive patients to assess its significance in the progression of liver disease, including HCC. 1. Huo TI, Wu JC, Lee PC, Chau GY, Lui WY, Tsay SH, et al. Sero-clearance of hepatitis B surface antigen in chronic carriers does not necessarily imply a good prognosis. Hepatology 1998 Jul;28(1):231-236. 2. Yuki N, Nagaoka T, Yamashiro M, Mochizuki K, Kaneko A, Yamamoto K, et al. Long-term histologic and virologic outcomes of acute self-limited hepatitis B. Hepatology 2003 May;37(5):1172-1179. 3. Honarkar Z, et al. Occult Hepatitis B as a cause of cryptogenic cirrhosis. Hepat Mon 2004;4(8):155-160. 4. Hollinger FB, Sood G. Occult hepatitis B virus infection: a covert operation. J Viral Hepat 2010 Jan;17(1):1-15. 5. Bréchot C, Thiers V, Kremsdorf D, Nalpas B, Pol S, Paterlini-Bréchot P. Persistent hepatitis B virus infection in subjects without hepatitis B surface antigen: clinically significant or purely "occult"? Hepatology 2001 Jul;34(1):194-203. 6. Pollicino T, Squadrito G, Cerenzia G, Cacciola I, Raffa G, Craxi A, et al. Hepatitis B virus maintains its pro-oncogenic properties in the case of occult HBV infection. Gastroenterology 2004 Jan;126(1):102-110. 7. Grob P, Jilg W, Bornhak H, Gerken G, Gerlich W, Günther S, et al. Serological pattern "anti-HBc alone": report on a workshop. J Med Virol 2000 Dec;62(4):450-455. 8. Chen YC, Sheen IS, Chu CM, Liaw YF. Prognosis following spontaneous HBsAg seroclearance in chronic hepatitis B patients with or without concurrent infection. Gastroenterology 2002 Oct;123(4):1084-1089. 9. Sheu JC, Huang GT, Shih LN, Lee WC, Chou HC, Wang JT, et al. Hepatitis C and B viruses in hepatitis B surface antigen-negative hepatocellular carcinoma. Gastroenterology 1992 Oct;103(4):1322-1327. 10. Paterlini P, Poussin K, Kew M, Franco D, Brechot C. Selective accumulation of the X transcript of hepatitis B virus in patients negative for hepatitis B surface antigen with hepatocellular carcinoma. Hepatology 1995 Feb;21(2):313-321. 11. Fang Y, Teng X, Xu WZ, Li D, Zhao HW, Fu LJ, et al. Molecular characterization and functional analysis of occult hepatitis B virus infection in Chinese patients infected with genotype C. J Med Virol 2009 May;81(5):826-835. 12. Chan HL, Tsang SW, Leung NW, Tse CH, Hui Y, Tam JS, et al. Occult HBV infection in cryptogenic liver cirrhosis in an area with high prevalence of HBV infection. Am J Gastroenterol 2002 May;97(5):1211-1215. 13. Hou J, Wang Z, Cheng J, Lin Y, Lau GK, Sun J, et al. Prevalence of naturally occurring surface gene variants of hepatitis B virus in nonimmunized surface antigen-negative Chinese carriers. Hepatology 2001 Nov;34(5):1027-1034. 14. Cacciola I, Pollicino T, Squadrito G, Cerenzia G, Orlando ME, Raimondo G. Occult hepatitis B virus infection in patients with chronic hepatitis C liver disease. N Engl J Med 1999 Jul;341(1):22-26. 15. Al-Mahtab M, Rahman S, Khan M. Occult Hepatitis B Virus Related Decompensated Cirrhosis of Liver in Young Males: First Report of Two Cases from Bangladesh. Hepat Mon 2008;8(2):147-150. 16. Carman WF. The clinical significance of surface antigen variants of hepatitis B virus. J Viral Hepat 1997;4(Suppl 1):11-20. 17. Protzer-Knolle U, Naumann U, Bartenschlager R, Berg T, Hopf U, Meyer zum Büschenfelde KH, et al. Hepatitis B virus with antigenically altered hepatitis B surface antigen is selected by high-dose hepatitis B immune globulin after liver transplantation. Hepatology 1998 Jan;27(1):254-263. 18. Carman WF, Zanetti AR, Karayiannis P, Waters J, Manzillo G, Tanzi E, et al. Vaccine-induced escape mutant of hepatitis B virus. Lancet 1990 Aug;336(8711):325-329. 19. Carman WF, Korula J, Wallace L, MacPhee R, Mimms L, Decker R. Fulminant reactivation of hepatitis B due to envelope protein mutant that escaped detection by monoclonal HBsAg ELISA. Lancet 1995 Jun;345(8962):1406-1407. 20. Ireland JH, O’Donnell B, Basuni AA, Kean JD, Wallace LA, Lau GK, et al. Reactivity of 13 in vitro expressed hepatitis B surface antigen variants in 7 commercial diagnostic assays. Hepatology 2000 May;31(5):1176-1182. 21. Hollinger FB. Hepatitis B virus genetic diversity and its impact on diagnostic assays. J Viral Hepat 2007 Nov;14(Suppl 1):11-15. 22. Zaaijer HL, Torres P, Ontañón A, Ponte LG, Koppelman MH, Lelie PN, et al. Multiple surface antigen mutations in five blood donors with occult hepatitis B virus infection. J Med Virol 2008 Aug;80(8):1344-1349. 23. Pollicino T, Raffa G, Costantino L, Lisa A, Campello C, Squadrito G, et al. Molecular and functional analysis of occult hepatitis B virus isolates from patients with hepatocellular carcinoma. Hepatology 2007 Feb;45(2):277-285. 24. Chaudhuri V, Tayal R, Nayak B, Acharya SK, Panda SK. Occult hepatitis B virus infection in chronic liver disease: full-length genome and analysis of mutant surface promoter. Gastroenterology 2004 Nov;127(5):1356-1371. 25. Cabrerizo M, Bartolomé J, Caramelo C, Barril G, Carreno V. Molecular analysis of hepatitis B virus DNA in serum and peripheral blood mononuclear cells from hepatitis B surface antigen-negative cases. Hepatology 2000 Jul;32(1):116-123. 26. Khedmat H, et al. Trends in Seroprevalence of Hepatitis B, Hepatitis C, HIV, and Syphilis Infections in Iranian Blood Donors from 2003 to 2005. Hepat Mon 2009;9(1):24-28. 27. Alavian SM, et al. Mass Vaccination Campaign against Hepatitis B in Adolescents in Iran: Estimating Coverage using Administrative Data. Hepat Mon 2009;9(3):189-195. 28. Alavian SM, et al. Hepatitis B Virus Infection in Iran: A Systematic Review. Hepat Mon 2008;8(4):281-294. 29. Alavian SM, Fallahian F, Lankarani KB. The changing epidemiology of viral hepatitis B in Iran. J Gastrointestin Liver Dis 2007 Dec;16(4):403-406. 30. Jazayeri SM, Basuni AA, Sran N, Gish R, Cooksley G, Locarnini S, et al. HBV core sequence: definition of genotype-specific variability and correlation with geographical origin. J Viral Hepat 2004 Nov;11(6):488-501. 31. Jazayeri S, Carman W. Evolution of Hepatitis B Genotype D in the Middle East and South Asia. Hepat Mon 2009;9(1):9-111. 32. Goodarzi Z, Jazayeri SM, Hepatitis B. Virus PreS Varian and Hepatocellular Carcinoma. Hepat Mon 2008;8(2):129-133. 33. Norouzi M, et al. Hepatitis B Virus Surface Antigen Variants Clustered Within Immune Epitopes in Chronic Hepatitis B Carriers from Hormozgan Province, South of Iran. Iran J Basic Med Sci 2010;13(4):213-224. 34. Minuk GY, Sun DF, Uhanova J, Zhang M, Caouette S, Nicolle LE, et al. Occult hepatitis B virus infection in a North American community-based population. J Hepatol 2005 Apr;42(4):480-485. 35. Tai PC, Banik D, Lin GI, Pai S, Pai K, Lin MH, et al. Novel and frequent mutations of hepatitis B virus coincide with a major histocompatibility complex class I-restricted T-cell epitope of the surface antigen. J Virol 1997 Jun;71(6):4852-4856. 36. Mancini-Bourgine M, Fontaine H, Bréchot C, Pol S, Michel ML. Immunogenicity of a hepatitis B DNA vaccine administered to chronic HBV carriers. Vaccine 2006 May;24(21):4482-4489. 37. Ijaz S, Torre F, Tedder RS, Williams R, Naoumov NV. Novel immunoassay for the detection of hepatitis B surface ‘escape’ mutants and its application in liver transplant recipients. J Med Virol 2001 Mar;63(3):210-216. 38. Yamamoto K, Horikita M, Tsuda F, Itoh K, Akahane Y, Yotsumoto S, et al. Naturally occurring escape mutants of hepatitis B virus with various mutations in the S gene in carriers seropositive for antibody to hepatitis B surface antigen. J Virol 1994 Apr;68(4):2671-2676. 39. Banerjee A, Chandra PK, Datta S, Biswas A, Bhattacharya P, Chakraborty S, et al. Frequency and significance of hepatitis B virus surface gene variant circulating among ‘antiHBc only’ individuals in Eastern India. J Clin Virol 2007 Dec;40(4):312-317. 40. Brojer E, Grabarczyk P, Liszewski G, Mikulska M, Allain JP, Letowska M; Polish Blood Transfusion Service Viral Study Group. Characterization of HBV DNA+/HBsAg- blood donors in Poland identified by triplex NAT. Hepatology 2006 Dec;44(6):1666-1674. 41. Chevrier MC, St-Louis M, Perreault J, Caron B, Castilloux C, Laroche J, et al. Detection and characterization of hepatitis B virus of anti-hepatitis B core antigen-reactive blood donors in Quebec with an in-house nucleic acid testing assay. Transfusion 2007 Oct;47(10):1794-1802. 42. Ahn SH, Park YN, Park JY, Chang HY, Lee JM, Shin JE, et al. Long-term clinical and histological outcomes in patients with spontaneous hepatitis B surface antigen seroclearance. J Hepatol 2005 Feb;42(2):188-194. 43. Zahn A, Li C, Danso K, Candotti D, Owusu-Ofori S, Temple J, et al. Molecular characterization of occult hepatitis B virus in genotype E-infected subjects. J Gen Virol 2008 Feb;89(Pt 2):409-418.